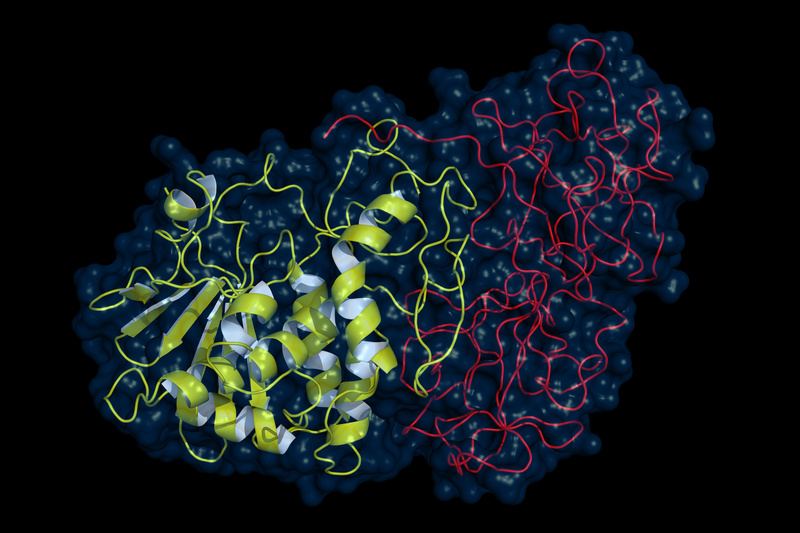 A molecule of ricin, one of the most deadly and common toxins discovered to date. An assay developed at Pacific Northwest National Laboratory can detect ricin and nine other biotoxins simultaneously, the largest panel to date. Enlarge Image. Results: The largest panel of biotoxins to be simultaneously detected to date has been achieved using an assay platform developed by scientists at Pacific Northwest National Laboratory. The enzyme-linked immunosorbent assay (ELISA) microarray simultaneously detected 10 plant and microbial toxins in buffer and clinical and environmental samples. These included ricin, botulinum neurotoxins (BoNT), shiga (STX), and staphylococcal enterotoxin B (SEB). Previously, the largest number of toxins to be simultaneously detected has been six. "Most assays to detect toxins target one or two toxins at a time, at best. In the event of a bioterrorist attack, it may not be obvious which agent was released, although this knowledge is critical for delivering appropriate medical treatment," said Dr. Susan Varnum, a biologist at PNNL who led the study, which appears in Analyst. "There's a pressing need for assays that analyze multiple toxins simultaneously so that in case of exposure, differentiation of multiple biothreat toxins can occur early enough for appropriate care to be given," Varnum added. ELISAs are widely used to detect the presence of a single antigen-or biomarker-in biological samples. This new microarray ELISA platform allows the highly sensitive detection of up to 50 antigens simultaneously. Typically, commercially available antibodies are used in the development of these assays. However, to differentiate among six closely related BoNT serotypes, the scientists used high-affinity reagents generated in the laboratory of Dr. James Marks, University of California, San Francisco School of Medicine. The new, highly sensitive assay design developed by PNNL is rapid, specific, and simple enough for easy adoption by other research groups. Why It Matters: Protein toxins are considered to be potential biological threat agents because of their extreme toxicity, widespread availability, and ease of use. Biothreat toxins have been stockpiled for bioweapon use and even used in previous bioterrorism events. To treat exposure to these toxins, sensitive and specific detection systems that can quickly identify multiple biothreat toxins are needed. The new assay platform affords simultaneous detection of 10 biothreat toxins simultaneously in a diverse range of clinical and environmental samples, including blood, saliva, urine, stool, milk, and apple juice. Methods: The research team based their diagnostic assay on the antibody microarray approach. Antibody protein microarrays are miniaturized, solid-phase analytical assays for the detection of many proteins in parallel. This approach uses an array of high-affinity capture reagents, or antibodies, immobilized on a glass slide. These spatially arrayed antibodies bind a specific antigen from a sample added to the array. A second, labeled antibody that recognizes the same antigen as the first antibody then is used for detection to form a "sandwich" assay. This sandwich approach favors specificity in analyte detection. The assay not only sensitively detected the biotoxins in buffer but also in complex clinical and environmental matrices at levels in the low picogram per mL-1 range and with a minimal sample volume of 20 microliters. The multiplex ELISA-based protein antibody microarray developed at PNNL demonstrates an excellent assay that can achieve some of the lowest detection limits and maintain sensitivity below the reported median lethal dose (LD50) in a wide range of biological fluids. Sponsors: This research was supported by the National Institute of Allergy and Infectious Diseases. Research Team: Kathryn Jenko, Yanfang Zhang, Yulia Kostenko, and Susan Varnum (PNNL); Yongfeng Fan, Consuelo Garcia-Rodriguez, Jianlong Lou, and James Marks (UCSF). Reference: Jenko K, Y Zhang, Y Kostenko, Y Fan, C Garcia-Rodriguez, J Lou, JD Marks, and SM Varnum. 2014. "Development of an ELISA Microarray Assay for the Sensitive and Simultaneous Detection of Ten Biodefense Toxins." Analyst 139(20):5093-5102. DOI: 10.1039/c4an01270d.